Over the years, Kitty Lunn’s name has surfaced off and on, especially in the field of dance. Last year, Kitty was a model for the Raw Beauty Project NYC and was an importance presence in their video, sharing her thoughts on beauty, sexuality and disability. She is truly a legend in her own time and we realized that we just had to feature this remarkable mobileWOMAN! Ms. Lunn’s love affair with the dance began at the age of eight, when her grandmother took her to see the film The Red Shoes. By the time she was fifteen, she was dancing principal roles with the New Orleans Civic Ballet, where she made her professional debut in the title role in Coppelia. Her work in New Orleans led to a scholarship to the Washington Ballet where she studied and worked with both Mary Day and the great ballet master, Edward Caton. Numerous ballets in which she danced include Swan Lake, Giselle, Les Sylphide and The Nutcracker. While in Washington, Ms. Lunn worked with such dance legends as Martha Graham, Agnes DeMille, Jose Limon and Eric Bruhn. Twenty-seven years ago, while preparing for her first Broadway show, she slipped on ice, fell down a flight of stairs and broke her back. Now a paraplegic, using a wheelchair, Ms. Lunn works diligently on behalf of performing artists with disabilities. In the Fall of 1994, she founded Infinity Dance Theater, a non-traditional dance company featuring dancers with and without disabilities. Infinity Dance Theater is committed to bringing the joy and drama of motion and movement to a new level of inclusion by expanding the boundaries of dance and changing the world’s perception of what a dancer is. 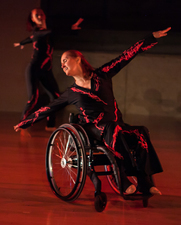 To this end, she has developed a wheelchair dance technique strongly rooted in and growing out of Classical Ballet and Modern Dance. I was born in New Orleans, Louisiana. When I was twelve years old, desegregation came to the South. It was really confusing…no one could tell me why I should be afraid…or what terrible thing would happen if a black child sat next to me? I lived three blocks from school and went home for lunch every day. I grew up in an upper middle-class family, and we had help in our house. Corrine was the great, great, granddaughter of a slave and could neither read nor write, but she was one of the wisest people I knew. One morning when I road my bike to school, some of the other kid’s parents were on their front porches throwing rocks at little black children being escorted by policemen to the first grade. It was just awful! When I went home for lunch, I asked Corrine what she thought about all of this. She just shook her head and thought for a moment…then she said…”Well, I guess folks gotta know their place, and go out and take their place”…. folks gotta know their place, go out and take their place! Hold on to that. Fast forward a few years, I’m at the Washington Ballet School. Let me tell you something…dancers are weird! Dancers spend all their time looking at themselves in a mirror, trying to live up to someone else’s idea of what constitutes a perfect dancer’s body. You’re constantly hearing, “You’re too tall, you’re too short, too fat, to thin!!!" What was I going to do? If I stood up very tall, on my best day I was only 5’4”. Mr. Balanchine wanted you to be 6’ tall on point! I had fantasies about having a bone transplant in my legs! The great Agnes de Mille was an Artist-in-Residence. I asked if she thought I should get a bone transplant in my legs so I could be taller. She took my face in her hands and said, “Kitty, dear, you have to learn to dance in the body you have”. Fast forward again, to Christmas Eve 1986. I had a day job to help support my dancing when we were laid off. One of the jobs I had was to produce the program for Midnight Mass at St. Patrick’sCathedral…and Mother Theresa was going to be there! That night, after Midnight Mass, Cardinal O’Conner invited everyone involved with the broadcast up to his residence for a late supper. There I was with my plate of cold chicken, salad and white wine… Mother Theresa came up to me…this tiny, wizened, weather worn person with the most piercing blue eyes I had ever seen! She looked at me and said very calmly, “My dear, I do not think you are leading the life you were born to live”! Well, I nearly fainted! Three weeks later I slipped on ice, fell down the stairs and broke my back! One piece of ice and two seconds…and my life changed in an instant. The ironic thing was, at Thanksgiving time I had met the most wonderful man. We had been to lunch once and dinner once. In fact I was on my way to a dinner date with him the night I fell. I gave someone his answering service number and asked them to leave a message for him. The next thing I knew, he was at the hospital, standing at my bedside. I was in the hospital for nearly three years, and we were married six months after I got out. I really tried to stop dancing…how could I dance if I couldn’t walk? I really tried to move past it…but I was very sad. I started dancing when I was eight years old…my grandmother took me to see the film, “The Red shoes”. I wanted to be that beautiful red-headed ballerina…and now I couldn’t walk. Andrew said to me, if you really want to dance…what’s stopping you? I was stopping me…fear was stopping me. My physical therapists helped me prepare to go back to class in my wheelchair. We set a target date…I went and put my money on the table…they had to let me in…the ADA said so. I took my place at the barre…yes, people stared at me…yes, it was awkward…but once the music began to play…I knew I was home…I would be ok. What happened to me was an accident…this is a choice. I had to learn to know my place, and go out and take my place, so I could learn to dance in the body I have, in order to lead the life I was born to live. I had an accident…but I choose to live…I choose to dance!